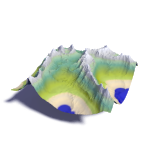 This section covers technical and data related subjects related to creating visualizations of the earth surface. I split this from the more specific planets rendering section which covers matters directly related to 3d earth renderings as you can see on the Views of the Earth site and in the Imagico.de services and products. I have structured materials here in the following three subsections. You can stay updated on new content with the geo-visualization category in the blog.